Derek Fordham Dipl Arch Hons, RIBA, FRGS of Ashburnham Grove was awarded a Polar Medal by the Queen this year for ‘outstanding achievement and service to the United Kingdom in the field of polar research’ as ‘Arctic Expedition leader, mountaineer and ambassador’, reports The Arctic Club. Derek was ATA Planning Rep for many years, still helps the ATA with planning, and spent a good two hours on gate duty at last year’s street party. He kept the ATA from extinction throughout a long dormant period before it re-emerged in 2006, and at that time was responsible (with two others) for closing off the play street. They physically built the planters at either end, with Derek supplying the bricks. He is also an executive member of The Greenwich Society and leads their Hacan group opposing aeroplane noise. ‘Derek’s involvement with the Arctic began in 1968 and 1969 when he organised university mountaineering club expeditions to East Greenland. 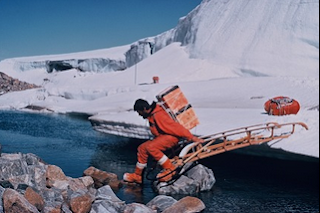 These were followed in 1971 by becoming the Anglo part of the Anglo-Danish Trans-Greenland Expedition which made the longest purely man-hauled sledge crossing on the Inland Ice. In 1976 together with his wife, Jeni, two Polar Inuit and 27 dogs, they dog-sledged from Qanaq in NW Greenland to Grise Fjord, Ellesmere Island in Canada, for which trip Derek received a Winston Churchill Fellowship. Sailing and kayaking trips to East and West Greenland followed with an RAF-supported traverse and plant-collecting trip on Hochstetters Forland. In 1982 he spent the spring with Inuit hunters out of Resolute Bay and Grise Fjord. ‘1984 brought a return to mountaineering with an expedition to Mont Forel followed by summers with the West Greenlanders hunting caribou around Sisimiut and Søndre Strømfjord. In 1992 and 1994 Svalbard beckoned and Backlundtoppen and Newtontoppen were climbed on skis. In The Watkins Mountains of East Greenland, Gunnbjørnsfjeld, the Arctic’s highest summit was reached in 1996 and Petermann Peak and Shackleton Bjerg were climbed in 1998. Together with committee member Lorraine Craig, Derek has been on expeditions to Kamchatka and in 2015 to Saqqaq in West Greenland where his Trans-Greenland expedition ended in 1971. ‘Derek has written regularly on Arctic issues for Mountain Magazine, until its demise, and for The Alpine Journal and various ski club journals He has provided book reviews for the science journal Nature and letters to The Times on polar affairs. In 1979 he wrote a book entitled Eskimos which was also published in Danish. Derek was the first name in the list of seven recipients of The Polar Medal 2016. It was presented to him by Prince William at Buckingham Palace on 22 April 2016. 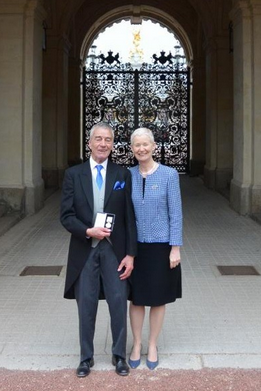 Derek is pictured, above right, at the palace with Lorraine Craig, fellow Arctic Club committee member and explorer. Thank you for sharing. Congratulations, Derek. Medals gets only to professionals and masters of their craft. When I was traveling at the North Pole, with me in the team support was a woman Dr. Susan Currie, who also received the award.